After Goalpara, now ISIS flag has been found in Lower Assam’s Nalbari district. 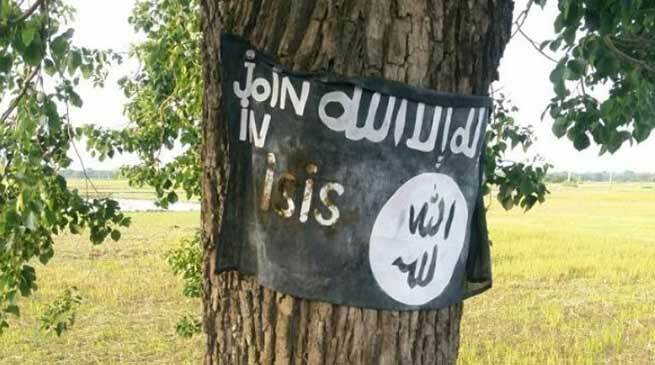 The ISIS flag was found with the message ‘Join in ISIS’ attached to a tree in Koihati area of Lower Assam district on Thursday. When locals noticed the ISIS flag, they immediately informed police who took the flag down. It must be mention here that two days ago, six ‘IS NE’ flags were found in Goalpara town near a police station. Locals who were out for a morning walk along the river bank found the black flags had something in Arabic written on them with ‘IS NE’, which might be the acronym for Islamic State North East. The two incidents have raised serious concerns among locals over fears that the terror group was trying to create a base and footprints in Assam. Meanwhile the Assam police have started an investigation into the matter. No one has been arrested so far.